Welcome! We are here to serve you and to help you put together your Custom Printed Desk Pad Calendars event with the preprinted desk pads, the Economy desk pads, and the Small desk pad calendars printed with your logo, business name and or advertising message, team and or school name; wedding celebrations, product promotion, anniversaries, employee schedules and grand openings with the best promotional desk pads you can find in the market. To enlarge the above pictures, click here. For additional Desk Pad Calendar designs/styles, click here. For Desk Pad Layouts, click here. your logo/ and or text you provide to us. 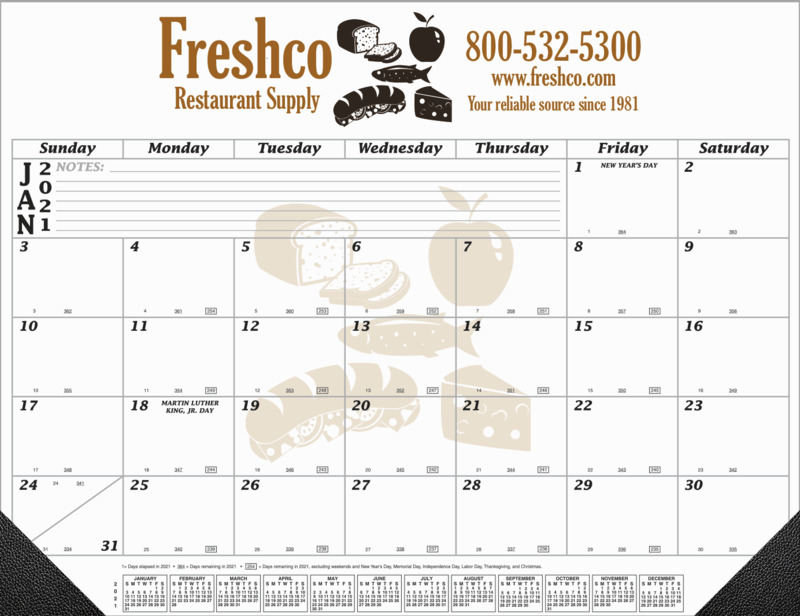 For Economy - Custom Printed Desk Pad Calendars, click here. For Wall Calendars Display Page, click here. We also customize Freestyle Pads/Calendars, #B841 in 25 sheets per pad as low as $5.24 each; #B842 in 40 sheets per pad as low as $7.17 each; and #B840 in 50 sheets per pad as low as$8.42 each imprinted with one of our standard colors. Call for quotation. For styles/designs available, chick here. B900 12 Month Desk Pad Calendar. January - December. (the layout for this calendar #B900 has lines thru the date blocks - see enlarged picture here). Product size: 21-3/4" x 16-3/4". Standard Stock: 60 lb. Titanium Bright white Paper. Imprint area: Top: 20-3/4" x 3-1/4". To select your imprint color(s): Click here. Two bottom corners: For choice, see list below. Requirements to prepare or to e-mail artwork to us, click here. B881 12 Month Desk Pad Calendar & Gray Grid. January - December. Product size: 21" x 16-3/4". Imprint area: Top: 20-3/4" x 3-3/4". Two bottom corners: To choose, see list below. Less than minimum Qty. $72.00 plus cost of item. For one-color imprint using non-standard colors, add $85.00. For two color imprint using standard colors, add $85.00 + $0.41 imprint charge per pad. For two color imprint using standard or both colors non-standard, add $170.00 + $0.41 imprint charge per pad. For more than two color imprint (minimum 1,000 Qty. ), contact us at the telephone number at the bottom of this page. For 4-color process imprint (minimum 1,000 Qty.) contact us at the telephone number at the bottom of this page. Drilled holes for wall hanging: $0.07 each. 13th Sheet available: December of current year to December of the following year (Ex. December 20XX-December 20YY). Add $0.32 per desk pad calendar. NOTE: All prices, quantities, sizes, designs, and/ or colors are subject to change without notice. Random sample: $15.50 each. Shipping cost will be additional (cost of item refundable on your complete order). ARTWORK: Please provide ready artwork in vector format 300+ dpi and email it to us in: .eps, .ai, .pdf files. To email your artwork to us, click here. If you need TYPESETTING ONLY, we'll use our standard font (Ex. : Arial, Arial Narrow, Times New Romans, Futura Bk, Futura Hv), or if you give it to us, we'll try to match it as close as we can. To find & to add the cost for typesetting, click here. Proof: Email: $28.00 for email/fax proof of your logo, text, or both. Any author's alterations made after the proof has been sent to you, click here for artwork modification/ preparation/additional charges. Choice of: Premium Leatherette corners: black, Navy Blue, Burgundy, Dark Green, or Red, or click here to select color. Please specify color on purchasing order or standard black corners will be used. Standard Imprint colors: Choose from our standard 4-color process: Black, Blue (293), Burgundy (201), Green (347), Orange (021), Red (185), & Reflex Blue; or click here to select color(s). Please specify color information on your purchasing order. Artwork charges, requirements to prepare and/ or to e-mail your artwork to us, click here. NOTE: If the artwork you submit to us needs to be redrawn, fixed, or typesetting, please click here. Phantom overprint: $40.00 extra per color. • Desk Pad Calendars compliment any promotion or event. • To enlighten business meetings. FOB plant. We will use our discretion as to the best method to be used. Please call us for approximate freight charges when ordering. Drop shipments not in increments of catalog minimum, add $8.00 per drop ship location. Custom Boxing: $8.00 per box. Type of Packaging: bulk, unless otherwise specified. Normally 20 - 25 business days in the plant from final proof approval and the receipt of complete purchasing order. NOTE: Orders received in the months of October, November and December may need additional time due to current production conditions. If an artwork proof is sent, please allow time for return of proof. Order your Desk Pad Calendars Now!, click here. For Economy - Desk Pad Calendars, click here. For Wallet, Pocket Calendars, click here. to say 'Hi' or to say 'Thank You' to your customers and or friends, or to say 'I Love You'. Many of these products are Made in USA. Back to ARMU main page. 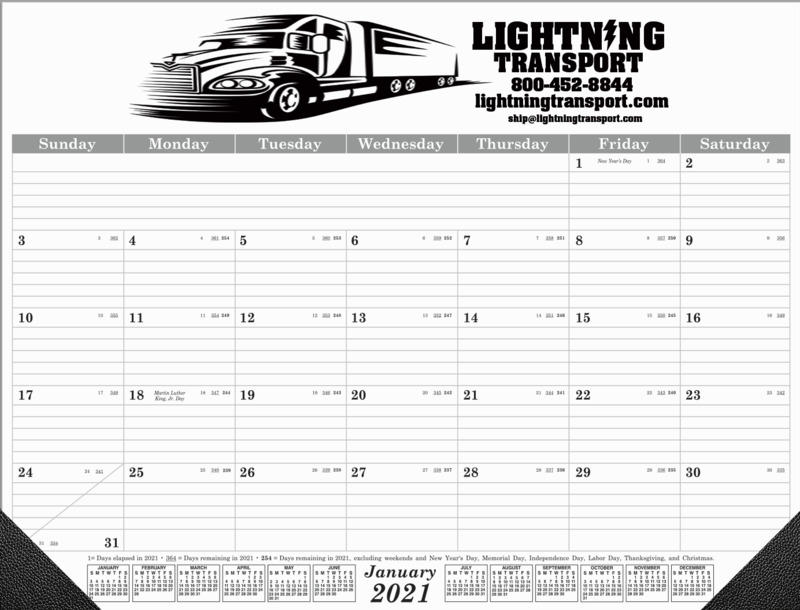 Order your Custom Printed Desk Pad Calendars NOW and save time and money! To place your order, click here. Then follow the instructions in the ordering form, or call us at the telephone number at the bottom of this page to place your order. Remember. Customer satisfaction and high quality service to our customers is our main goal. To EMAIL your questions, purchasing order, artwork, or inquires, click here.